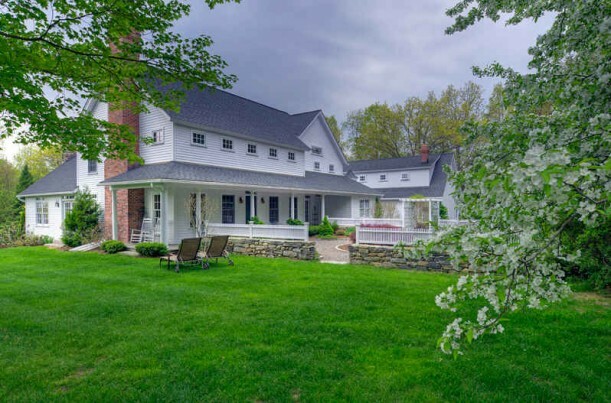 I found what may be my dream home, described in the listing as a “Country Cape” in Washington, Connecticut. I’ve always fantasized about having a country house like this — possibly because I’ve watched too many old movies that feature them, like Bringing Up Baby and Christmas in Connecticut. This one may look like an old farmhouse that’s been renovated, but it was actually built in 2005 with authentic beams and fieldstone and lots of beautiful woodwork for added character. Can’t you see this house all styled up for Country Living magazine? It has 4,700 square feet, 5 bedrooms, 4.5 baths, and a separate apartment over the garage. Want it? (I do!) Asking price is $1.495 million. For more photos and information, check the listing held by Carol Bablonka of Klemm Real Estate. This house will sell in a heartbeat! Country Living people. The placement of furniture is off. I hope you’re having a great Sunday. $1.5 M – what a bargain – such a gorgeous home. It’s exteriors like these that make me wanna look inside, so glad you posted about it!!! If I had an extra $1.5 M laying around I would grab this house! It is beautiful – thanks for sharing! I love the portico!! The floors, the beams, the fieldstone wall! I hope you will come and enter my Giveaway from Interieurs! Very, very nice!! I love that type of house. I’m loving this house! And I swear, I watch Baby Boom just about every time that I see it on – specifically for that country house!! I might consider moving away from my grown children and grand children for this one! I could not make this more perfect. Lovely country home, love your site, I visit it almost daily now, I am SO glad you have the same illness as I do, a complete addiction to homes. Why did I wait so long to become a realtor, its the perfect job for us! Hi Julia, as I just wrote on FB, this is the town where my love of New England architecture began!!!! We lived in Washington, Connecticut in the 1970’s. You should SEE the homes and schools here! add in the spectacular topography and the entire area is absolutely stunning! This was the feeling I tried to copy for our main home. Wow! That place is gorgeous! Totally my style. I never thought that I would fall in love with a portico. What wonderful construction for a newer home. I want it! LOVE it!!!! It’s exactly what I would be looking for, inside and out. Now if it was only in my area…. Seems like such a bargain – I went to an auction in my area (Sydney Australia) yesterday, and that amount only bought a dilapidated shack on a block of land!!!! I love a big country home like that, too. Very similar to Karen’s house of This Old House 2 blog. What a gorgeous house. I love it! My dream is to have a country home too. Especially one with a porch. Some of my favorite country homes from movies/tv include: Miss Honey’s big house in Matilda, Anne of Green Gables, Dr. Quinn, Beethoven, Little Women made in 1994 and I’m sure there’s more, but that’s all I can think of off the top of my head. I’m not so much a country kinda girl, but could probably muster a little bit of classy country for this beautiful abode. If only I could muster the $1.495 million that goes with it!! Love it. Stunning and for such a big house the rooms are still human sized. Beautiful and yet still cozy. Wish I could see the floor plans though. The kitchen is open to the dining room but the breakfast room looks almost cut off from it with no windows except the far doors, but it might just be the way the photo came out. Dream house! It is so warm & cozy despite its’ size. All the interior & exterior organic elements meld beautifully…timelessly…it looks like home. You’d never know it was newly built. This house could convert a city mouse! The windows are fantastic! Looooooove this house! it is *me* but not the price tag (sadly) although I think it is worth every penny! Oooh, that’s a pretty one! Great classical bones, but I agree the furniture is very unfortunate and should be donated to the local Goodwill. As a professional garden designer, I would love to fix the gardens. I’ve seen better landscaping in front of McDonalds. What a romantic bathroom, love it! Hey Julia, tried to find your email so I am posting this. I hope I don’t get into trouble, but remember Doc Martin’s house in Port Isaac, Cornwall? Season 5 is now posted on youtube, Episodes 1 and 2. Episode 3 to be posted shortly, for all you Doc Martin fans. The reason I have sent this to you is because it will be several years before this comes to PBS. Now we can watch it now! Thank you. Hope I didn’t step on your toes! Yes, please. I love all of this. Fabulous find, Julia. This just makes you want to walk in, kick off your shoes and say “I’m home.” This one is a keeper. Everything about this house is perfect…everything! There isn’t one think I’d change. they did a beautiful job on this one. Idyllic! You sure know how to pic em! Could a home be anymore perfect? Wonderful!!! This house makes me want a cup of cocoa and a wool sweater! Then I can plunk down on the sofa and watch Baby Boom!!! Love that style, and the Hillstead Museum is beautiful. Thanks, Richard! This is an amazing house ! I would love to have the dining room ! Yes, very charming indeed. Even with the dark clouds rolling in!